1839 Liberty Head $10 gold coins mark the second year of the series. 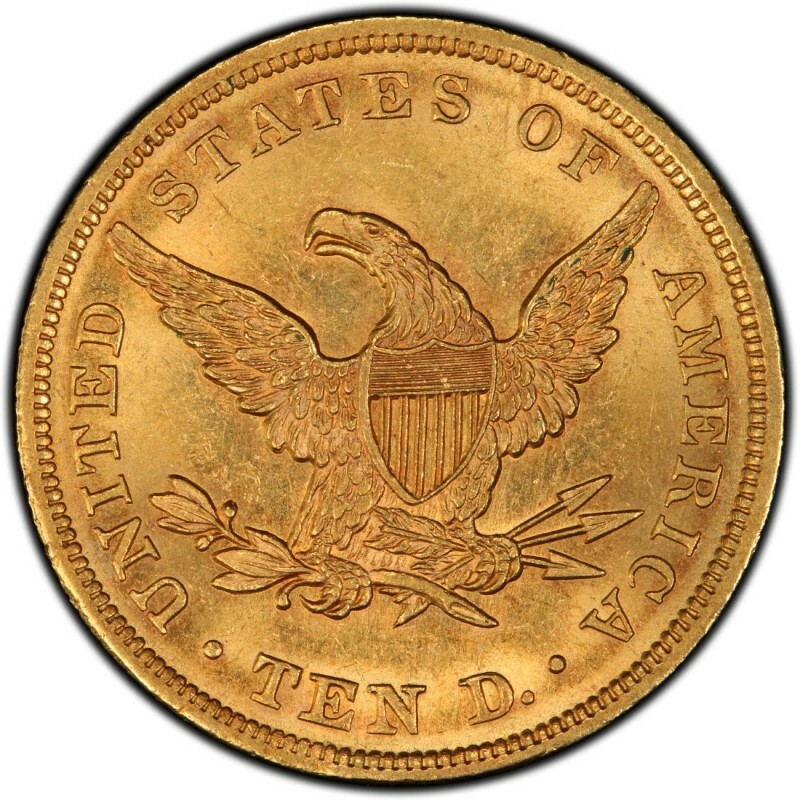 The Liberty Head $10 gold coin was the first eagle coin minted at the United States Mint since 1804. Aside from a change in design, the most important difference between the earlier $10 gold eagle coins and the “newer” ones is that the weight and size of the coin had changed. The Liberty Cap eagles, which were made from 1795 through 1804, measure 33 millimeters wide and weigh 17.50 grams, whereas the Liberty Head gold eagle coins are only 27 millimeters wide and 16.72 grams in weight. During the earlier part of the year, the original design from 1838 was carried over. The 1838 design has a slightly different head than the pieces made later in 1839 and thereafter. One difference between the two heads is that the head of 1838 has a slightly curved nose line whereas the nose line of the newer head is nearly straight. Also, the “L” of “LIBERTY” on the headband falls just to the left of the sixth star (counting from the first star left of the date). With the newer head, the “L” falls just to the right of the sixth star. 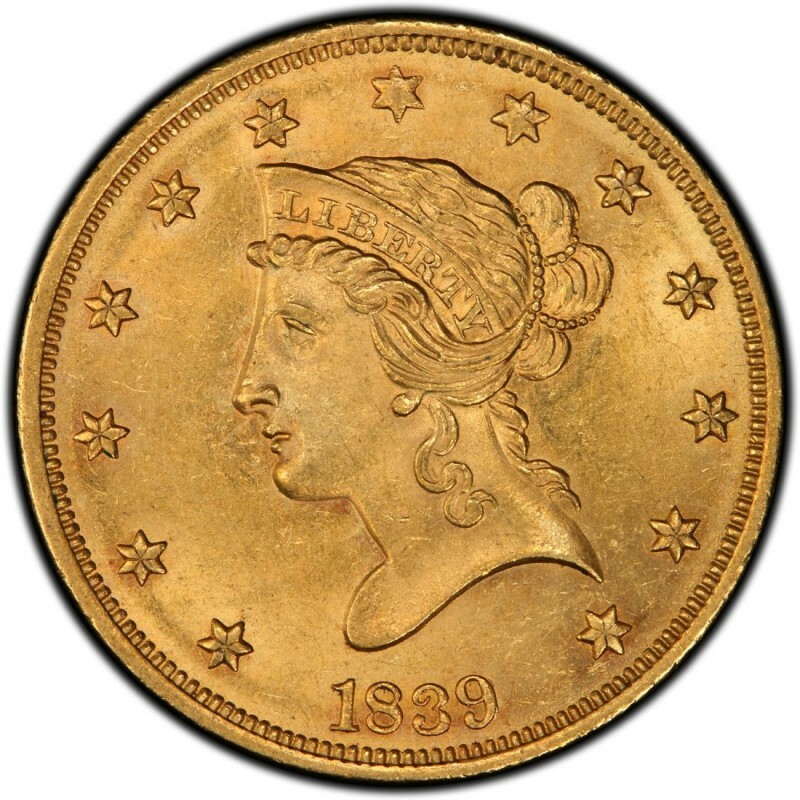 The 1838 Liberty Head $10 gold coins were made in very small quantities, with just 7,200 rolling off the press during the first year of production. Making matters even tougher for coin collectors who want an example of an 1838 $10 coin is that much of the original mintage has long since been melted or lost to time, meaning that just a fraction of the 7,200 exist today. Still, as few collectors pursue 1838 gold coins, the $10 gold coin can be bought for about $1,800 in Very Fine 20.